The river Olše or Olza is a border river dividing Těšínské Beskydy into Czech and Polish part. Is inextricably linked to the life of local people and the history of the region. From today's perspective it offers many opportunities for tourism and recreation. One of them is cycling along its course. Travel from Jablunkov upstream the river Olše along the cycling route no.56. In Bukovec closely monitor the information boards and signs to turn left correctly to a new "border crossing on the tourist path " Bukovec-Istebna. 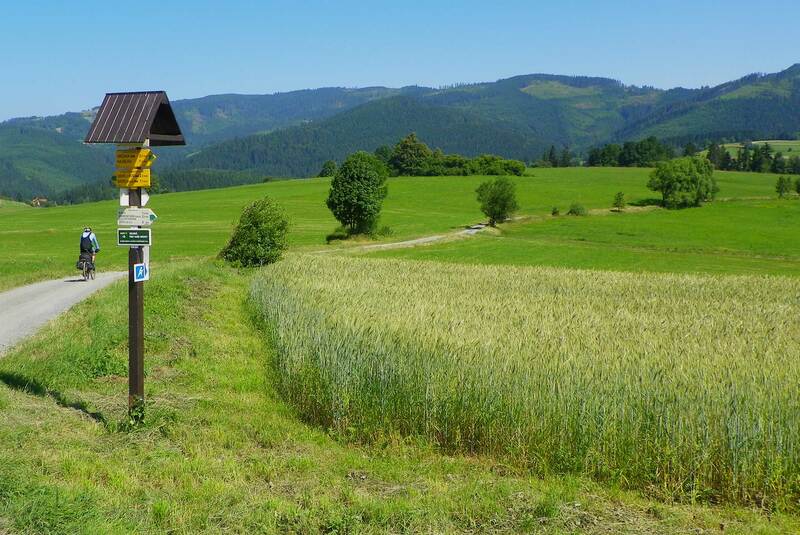 The transition is located directly on the bridge over the river Olše and we get to it along a flatland! If you start to go up the hill you did not turn correctly and we recommend you to return. On the Polish side the trail rises slightly, to go along the flow of the river called Olza here. In the premises of the natural amphitheater in Istebna we link the green marked path and cross the main road. By the pub Zaolzianka we meet marked cycling route no.24 C to part with it again soon. We will remain faithful to Olza River to the point where the road ends at the foot of the mountain Ganczorky. Here we have to walk - about 15 minutes up the hill to seek the real source of the river Olza. We can go back the same way or we may use the cycling route no. 125Z by the inn leading to Jaworzynka where we cross the border again and then use any possible way to get to Jablunkov. If you choose different way back, please count with greater difficulty and elevation. If you like enjoying a cycling trip in a bigger group, go on this route together with others on Saturday around St. John (24.6). In addition to cycling the cultural program, sitting around a campfire and other entertainment are prepared for you.